← Luke Study Week 3- What is Repentance? One of the things that I found challenging when I first arrived was to find places to take the children to where they could have fun, learn new things and experience this amazing country. I have decided that I will write a review of the places that we visit, so to encourage others to experience this country with kids in tow! Pierette is an indoor play area that is a 10-15 minute walk from Futako-tamagawa station. We took the Den-en-Toshi line from Shibuya, but as it is a continuation of the Hanzomon Line, you can get on earlier. If you catch the express train, it’s only 10 minutes from Shibuya. There were lifts at the station so getting around with a stroller was no problem! Upon arrival, you leave your shoes in a locker and hand the key over to the cashier who gives you a timed receipt. You hand this back at the end and pay. We were there for a couple of hours so paid the day rate (Y1400 for Mum and child). : A ball pond (or should I say lake) with a ship climbing frame in the middle so the children can jump into the balls, slide down the slide into the balls or climb up the rope rigging. : An area where there is a train set, toy cars, books and puzzles. J loved this area- but then again any area that has trains he loves! : A ‘sand circuit’ area where the children could ride on scooters, tricycles round a circuit. There was also a sandpit in this area. 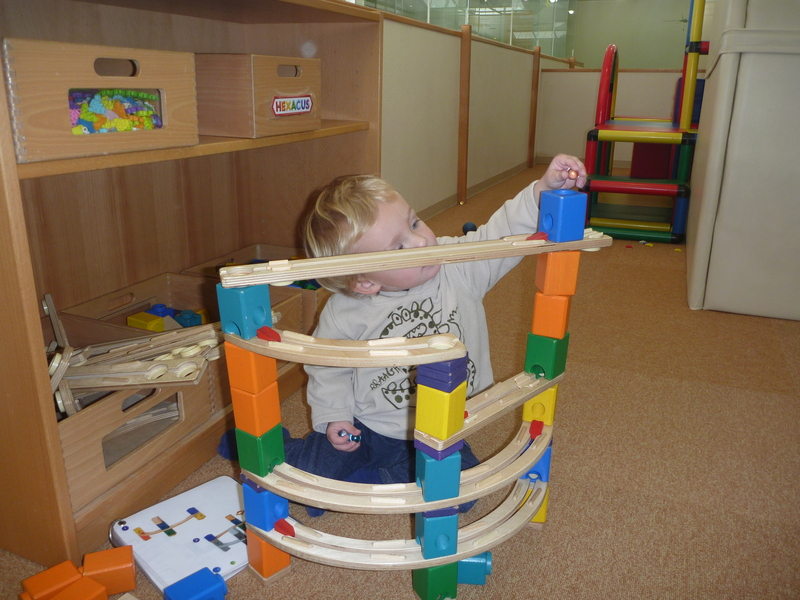 : A quiet area- where the children could sit and build- marble runs, geoblocks etc. : A baby area with a door like gate that was closed from the inside so tiny people can stay in and little people can stay out. : A shop and kitchen area for imaginative play. Our group of toddlers rather enjoyed filling the shopping baskets with the food, bringing them to us and then pouring the contents at our feet! You aren’t allowed to take your own food in, but their restaurant is very reasonable and the food is tasty. I ordered the children’s chicken basket which had 4 pieces of chicken nuggets (Japanese style of course), some chips, a bread roll and jam, a little jelly pot and a drink. I also ordered another portion of chicken and then J and I shared the food. It came in total to Y980. Overall Pierette is a lovely place to visit. It is clean, tidy and very safe. Our visit included a 7 month pregnant Mum with a 2-year-old and another Mum with a 3-year-old and a 1-year-old. They were both very impressed and the expectant Mum is planning to go back with her children (ages 2, 41/2 and 5) before the baby arrives. For me that says how easy and manageable a venue it is. So, if you are looking for a trip out. Do pay Pierette a visit! 2014 Update- A friend and I thought we would take our boys to Pierette so they could burn off their endless energy. Unfortunately it is a building site. There was a huge digger in the process of tearing it down. I’m not sure whether they are planning to rebuild, I will update this post when I know more. This entry was posted in Fun Days, Good days, Parenting, Somedays, Tokyo and tagged indoor play area, Pierette, Tokyo with kids. Bookmark the permalink.